What in tarnation is this all about. Makeup and breakup songs? Seriously? It makes me long for the days when Top 4 or 5 on American Idol thematically planned Big Band night and legends such as Tony Bennett acted as a worthy mentor for these kids. After all, last time I looked, he is still a performing force at 80 plus years and could impart valuable expertise to these singers – such as articulating your lyrics, becoming more inventive with your phrasing and connecting with authenticity and continuity to your audience. Oy – what has happened to this beautiful show that garnered the attention and adoration of millions of viewers each week? I had a crazy thought and it would have added a neat twist to this show – why couldn’t the individual judges act as mentor for three weeks in a row? Each would grab a week that highlighted music from their specific genre of music. For instance, J-Lo could mentor the singers in the style of Pop/Latino music, Keith Urban could take on Country and Harry Connick Jr. would handle Big Band night. It is too late for this but what do you all think? It would level the playing field for all the singers and allow the judges to fortify their opinions in a significant way. The American Idol Top 4 show begins on Fox at 8:00 PM on Wednesday, May 7th, followed by the Results Show at 9:00 PM on Thursday, May 10th. No lie–I heard the theme and thought, “Ah, yes, another ‘sing anything you like’ week”! Some of the themes they had in the past made little to no sense, it’s true, but if they were going to give up themes they should have said so! Rereader – haha. From your lips to Idols ears. But seriously – they have to look outside their box and everyone else’s to make any sense on how to improve the show. And/or go back to the elements that made the show so special – like the Top 24 Semi-Final. And finding a veritable mix of outstanding talent from every genre and age group. Everyone in the Top 12 should scream STAR. Then we would have ourselves a competition. I wouldn’t mind if they went for star potential, because a growth arc is nice to watch–but the contestants should be close enough that they can reasonably be expected to grow sufficiently to reach “star” before the finale, not a year or so out! It would also help if they would get rid of Randy and get in some REAL mentors–frankly, I think no mentors would be an improvement over him. And I think it would help if they raised the minimum age to 18 at the time of tryouts–or at least a high-school diploma. It’s not fun to watch kids falling short for want of another year or four of life experience. Oh how right you are ReReader. However, if they are dead set against changing the age range, then, at least, consider young adults in their mid to high 20s. Michael Buble wasn’t discovered until he was 27 for crying out loud and his success speaks for itself. Experience, hard work, talent – these elements create stars. I too am disappointed with Caleb’s attitude. Why the heck does he want to be in this business if he treats his fans this way. If there’s any justice, he’ll go home tomorrow! I’ll have to take everyone’s word for idol tonight…not watching!!! I picked I can’t help falling in love for Alex. Jena stole it! Love Me by Elvis was the better choice for Jena, but now we will never know. The greatest person (in my estimation) that ever lived forgave those that crucified him. I can forgive Caleb his mistakes. He will learn and grow up, as we all have had to do in one form or another. Don B and Hunter. We can forgive him – sure. But I will not comment on his performances. His remarks were so hurtful on so many levels and this is not the kind of person I want to see or celebrate on this show. In my mind, he has tainted the entire show this season and shame in the the judges and producers for dismissing his despicable, ungracious behaviour. I think TPTB believe a good portion of the viewing audience hasn’t heard Caleb’s remarks. This has taken away from my enjoyment of his performance. I think Jessica really tried. The comments from the judges didn’t quite set well with me. I loved Jena’s performance, but I don’t know if she was off key or not (with the Elvis song). Alex didn’t do it for me this week. I’m not sure who is going home, but it won’t be Jena. I agree with forgiving Caleb…that said he took himself to the idol audition not once not twice but three times! He signed up for this, if he can’t handle a few weeks of fans, how in the world will he make a career out of this…the world already has one Beiber!!! I think idol is being remiss on not booting him off, but I have a feeling they are going to leave the dirty work to the fans and if I had to guess who is going home without evening watching last night…Caleb, pack your bags buddy! Vonnie – this show is struggling so much that I know that TPTB want a Jena/Caleb Finale. I will be surprised if Caleb leaves tonight but, if he does, it will be a pleasant surprise. Anything to wipe that smug look off his face. He does not care about anybody except himself. Yes! We know that it is possible that they say who stays and who goes beyond Votes! But I think it could be a Jessica/Alex Finale! Unfortunately, I don’t see Caleb going home tonight. His one performance was quite good. I’m guessing Jessica will leave, but it could also be Alex. I’ll be pleasantly surprised if it’s Caleb. I hope wish and pray Caleb is a shocking boot tonight. I really enjoyed Alex. All three songs. He changes it up and its too much doesn’t change it and he hasn’t changed it enough. Caleb doesn’t change anything. He is never called out about that. Aubry-You’re right! The judges never do encourage Caleb to reconstruct songs. It’s funny, Randy mentioned the other day about not making a song sound kareoke, but that’s what I’ve found Caleb doing so much of the time. And yet Randy says the competition is his to lose? WHATEVER!!! I’m also getting sick and tired of Jessica getting so much crap. I did agree that one of her song choices wasn’t so good, but she’s done better than she’s given credit for. They keep giving Caleb a free pass, and I’m so sick of it! He’s no David Cook or Adam Lambert, and on top of it, he’s so ungrateful to his fans! TPTB really want his to get that very special homecoming??? I think that for forgiveness, there has to be repentance–and I’m still waiting on that. I think it will be Caleb and Jess in the B2. I just hope Caleb gets the boot so I can witness his shocked face. Bwa and I hope that forces him to realize he should never be ungrateful for older fans. He should never call anyone retards nor hope for cocaine and whores. So agree Aubry. I have never met such an ungracious performer on this show. Certainly his personality would have come through during the Hollywood rounds. Why even choose someone like that for the Top 32 or whatever the number was for the semi finals? i think alex will win. jena will be runner up. caleb will be number 3. and jess will be number 4. Yes he is backtracking and back pedalling like crazy but it is much more sincere and I thing he realizes that he made a nuge, HUGE faux pas. Thanks for adding this RR. 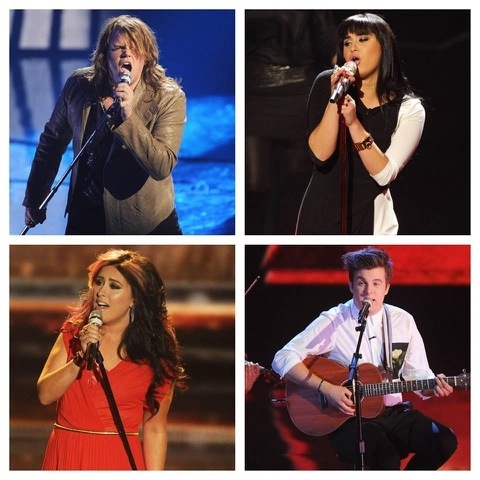 One of the worst weeks in reality TV singing competitions the I can recall. First The Voice cuts three contestants at once for no apparent reason. That had to be humiliating for all three after having their head pumped to twice normal size for weeks. Two of them were very talented and one had a lot of promise with the right training. Then the senseless drama of a self absorbed young man, accompanied by the wrong response from the entire Idol organization, including the voters. Sad. To finish the week, they have demonstrated that even under new management, they still know how to target a young woman, abuse her, steal her dream, make her cry and throw her away. Wow Gene. Very well said. Especially in terms of Jessica. I thought these judges would be better but they are not. Not at all. They have been crucifying Jess and Alex from Day One and the other two can do no wrong. Makes no sense. And is so unfair. Nitpicking at some and giving other a pass and free rein every week is not a fair way to run a competition. And they have renewed this show for another season? Give me a break. . I would like to wish you and each and everyone of our mothers in the group here a very Happy Mother’s Day on Sunday. Many of you have shared snippets of your lives and families with us over the years and even at my age, you continue to do what women and Mothers do, and that is to have a civilizing effect on those you touch. It is an understatement to say that you do God’s work. Thank you all and enjoy your special day. Thank you Ma’am. I meant to put both of my post on the latest page though.